National Basketball Association Hall of Famer and All-Star MVP Lenny Wilkens talks about his family, foundation and award-winning career. 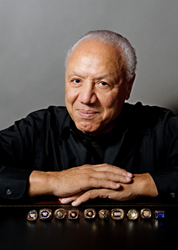 Wesley Homes Retirement Communities and Home Health Services welcomes three-time NBA Hall of Famer and former Seattle SuperSonics player Lenny Wilkens to its Des Moines campus on Tuesday, October 13 at 7:00 p.m. Call 206-824-5000 to RSVP. He will also discuss the Lenny Wilkens Foundation, which has raised $7.5 million to support programs and services for children in the Puget Sound area, his faith, having an absent father and how he did not let the conditions of his youth confine him. “You can either allow your circumstances to be a trap that snares you the rest of your life, or you can use them to learn what it takes to succeed in a world where things won’t always go your way,” said Wilkens. This belief has been demonstrated by Wilkens throughout his basketball career. His numerous honors and stats include College Basketball Hall of Fame; nine NBA All-Star appearances as a player and four as a coach; All-Star MVP and Coach of the Year recognitions; an NBA Championship with the Sonics, who retired Wilkens’ Number 19; and 50 Greatest Players in National Basketball Association History as a player and top 10 as a coach. Additionally, Wilkens coached the 1996 U.S. Olympic Basketball Dream Team II to gold. He holds several honorary doctorate degrees. He served as vice chairman of the Sonics ownership group and was President of Basketball Operations for the Sonics. Established in 1944 and affiliated with the Pacific Northwest Conference of the United Methodist Church, Wesley Homes operates two retirement communities and a home health agency. Wesley Homes Des Moines is a continuing care retirement community offering independent living cottage homes, apartments, assisted living and skilled nursing. Wesley Homes Lea Hill in Auburn offers Village Homes, apartments and memory care. Wesley Homes Home Health provides home health services to clients throughout the Puget Sound region.